DNC Chairman Tom Perez continued to dodge questions about endorsing House Minority Leader Nancy Pelosi to House speaker at an event two days after Democrats regained a majority in the House. 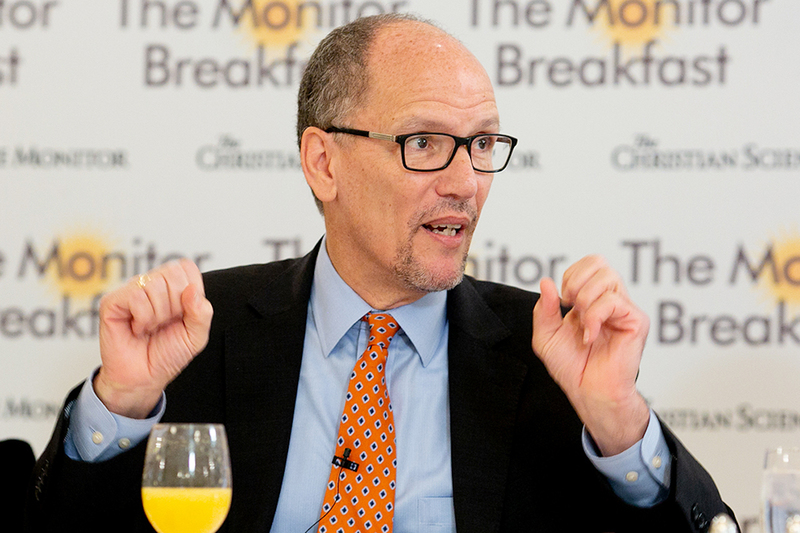 Perez was asked at a Monitor Breakfast in Washington, D.C., Thursday morning if he would take a position on endorsing Pelosi as speaker. The DNC chairman would not endorse Pelosi, instead saying he believes Democrats in the House should make the decision. He said he has “great respect” for Pelosi, but would not give her his endorsement. “The second question that I’ll address as well which is the speaker issue. Obviously the Democrats will resolve that now and I’m glad that we’re at the point where we are able to do that. I have great respect for Nancy Pelosi. I think this decision should be up to the Democrats in the House. And I’m sure that one question that people will raise, their way in making their judgment, is you know, what are the most important issues confronting America and who is best situated to do it,” Perez told reporters. “I’m so grateful for the work that she did in bringing the Affordable Care Act to the American people. Without Nancy Pelosi, we wouldn’t have an Affordable Care Act and health care is the number one issue on the ballot. And so as members vote on who to have as our leader of the House, House speaker I should say, I’m sure that will be one factor that people will weigh because .. we have to make sure we deliver on our promises of protecting access to health care for people across existing conditions and bringing down the cost of prescription drugs. And so I’m confident that people will weigh that as they move forward,” Perez continued. “Well, again, I think it should be up to the House members to do this. I mean I have profound respect for Nancy Pelosi and what she has done. I think she’s been one of the most impactful speakers and minority leaders in the history of the house,” Perez responded. Pelosi has previously said she thinks she’ll be the next speaker of the House, despite Democratic Reps. Kathleen Rice of New York, Seth Moulton of Massachusetts, Filemon Vela of Texas and Tim Ryan of Ohio, who have all called for Pelosi to relinquish her leadership role.